“I can go into China whenever I wish to,” Morris Cohen bragged to a studio audience during a 1960 broadcast of the Canadian quiz show Front Page Challenge. “Well, I’m interested to know how you can do that as you once worked for Chiang, Chiang Kaishek,” a panelist remarked. Gen. Morris “Two Gun” Cohen had long fascinated those who met him. His story seemed two outrageous to be true. And of course many of the details weren’t true—he was known to exaggerate, scam and self-promote. It’s difficult to parse fact from fiction when examining his life. 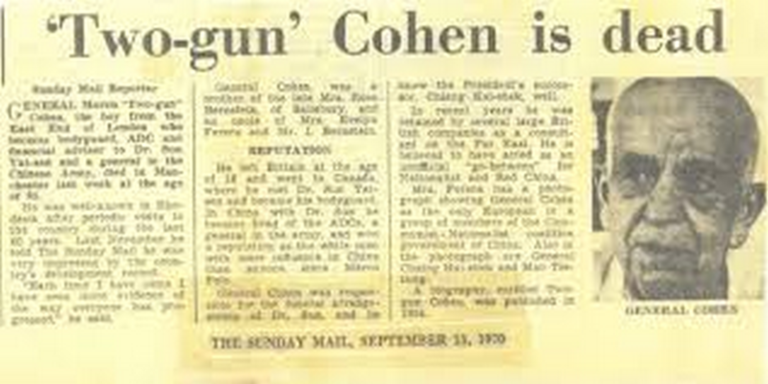 Cohen went from being a gambler and con man on the Canadian prairie to becoming the bodyguard of Chinese president Yatsen, and eventually a general in the Chinese army and a British spy. He was born Moisha Cohen to a poor Jewish family in a village outside of Warsaw, Poland in 1887. Soon after his birth his parents escaped the pogroms and resettled in a Jewish neighborhood in London. They’d hoped their son could get a decent education. But the young Cohen seemed uninterested in books. He was more interested in going to boxing matches and soon developed a reputation as a pick-pocket, leading to an arrest in 1900. By 1905 his parents shipped him off to Canada to work on farms, hoping the experience might reform him. He worked for a time on a farm near Saskatchewan where he learned to take care of livestock and how to shoot a gun. But he also learned how to play poker. He made his way west as a gambler and a grifter, getting in and out of trouble with the law. But he also had legitimate hustles — he cultivated an instinct for real estate. Along the way he met Chinese laborers and developed an affinity for Chinese food and the game mahjong. During a misadventure in Saskatoon, Cohen went to a chop suey joint he frequented that belonged to an old Chinese immigrant named Mah Sam. When he walked in, he saw a white man robbing Mah. In his retelling, he knocked the man out cold, took his gun, returned Mah’s money and dumped the would-be robber in the street. It was rare for a white man to side with the Chinese, let alone fight on their behalf. From that moment on, the all of Saskatoon Chinese community knew Cohen. They began to talk to him about their homeland and its politics. He learned that many of them wanted to overthrow the Manchu rulers. Eventually they invited him to join the Tongmenghui, revolutionary leader Yatsen’s anti-Manchu organization. Cohen began raising money for the cause, which he continued to do when he moved to Alberta to take on a lucrative real-estate gig. China broke out into revolution in 1911. 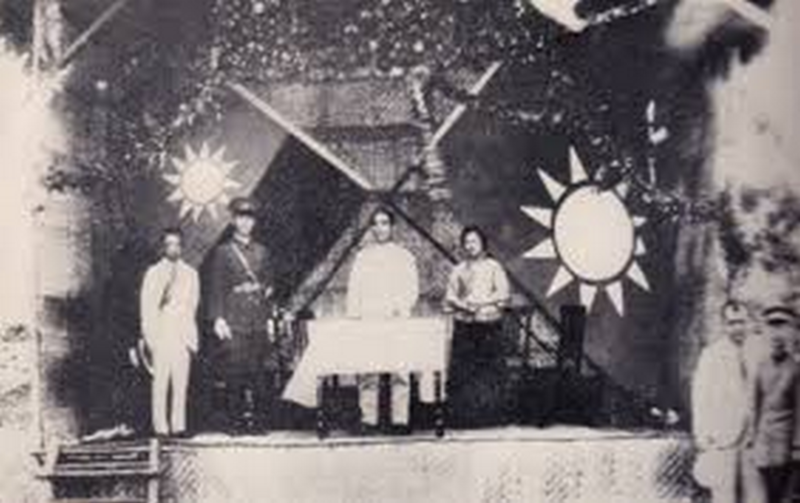 Sun was a key architect of the revolution and headed the Kuomintang nationalist movement and became the founder and president of the Republic of China. However, the fledgeling republican government controlled little territory, warlords seized most provinces and began warring with each other — often with the backing of western governments and companies using them as proxies. Chinese Canadians began aggressively raising funds for Sun’s movement. Cohen supported his friends. But when World War I broke out in Europe, he answered the Commonwealth’s call. He enlisted int the Corps of Canadian Railway Troops serving in Europe. The broken Cantonese he’d managed to pick up became an asset, his superiors found him particularly useful in supervising Chinese laborers helping the Allied war effort. When he returned to Canada after the war he found that the real-estate boom had ended. In 1922, he sailed for China. Not long after arriving in Shanghai he managed to make Sun’s acquaintance and helped him close a railway deal. Sun and Cohen got along well. Both had been sent away by their parents for unruly behavior and reinvented themselves. Sun — educated in Honolulu and Hong Kong — spoke fluent English and so did most of his family. Cohen, who began training some of the revolutionaries how to box and shoot, soon became a trusted bodyguard. He accompanied Sun on meetings with warlords, triads and nationalist troops. Westerners in China began calling him “Two Gun Cohen.” But his Chinese friends called him Ma Kun. He became particularly close to Sun’s wife Soong Ching-ling. She was one of the daughters of successful Shanghai businessman Charlie Soong. Westerners were impressed with her beauty and command of the English language. Educated in the United States, she spoke English with a Georgia accent. As a cockney-accented white man who favored .45 Smith & Wesson revolvers and wore tailored suits, Cohen stuck out conspicuously in Sun’s entourage. During a trip down the coast aboard the S.S. President Jefferson toward Hong Kong*,* American Journalist Junius Wood observed Sun’s group. Cohen regularly blew his paychecks on food, drinks and women. He told people Sun had made him a general but at the time held no such official title. Newspapers in China and in Canada struggled to make sense of the of the colorful character. So did Canadian authorities. The Royal Mounted Police opened an investigation into his activities in China, suspecting he may be involved in an opium smuggling scheme, though none of his associates in Canada cooperated with the investigation. Sun was continually warring with Warlords and quarreling with Western governments that feared his troops might actually unify China—threatening the relative ease with which many foreign companies were able to do business within the country. However, Western armament firms were more than happy to work with anyone who was paying—and Sun was willing to pay. Cohen returned to Canada to buy weapons for the cause. Vancouver’s Chinese community greeted Cohen as a hero when they learned who he was. He regaled friends and acquaintances with tall tales of adventure. But back in China Sun lay dying, leading to a desperate scramble for power. When news of his death reached Cohen, he rushed back to China. Chiang largely took the reigns of the Kuomintang — with whom Cohen was acquainted but had no real relationship. Chiang had little time for him, and quickly set his attention on the Northern Expedition Campaign to seize Beijing and unite China under Kuomintang rule. Cohen’s ties had mostly been to Sun’s family and Cantonese Kuomintang members. He worked closely with his widow Soong Ching-ling, his brother in-law T.V. Soong and friendly Cantonese warlords. They put Cohen to work running security details and facilitating arms deals with Westerners. He also helped squash labor disputes and was actively involved in purging Communists. Eventually he was made an “acting general,” a title he had claimed for years and could now claim truthfully—thought it was mostly ceremonial. He neither wore a uniform nor actually commanded any troops. When Japan invaded in 1937 he continued overseeing arms deals but he also secretly began talking to the British SOE. He was in Hong Kong when the Japanese invaded in December 1941. He arranged for Soong Ching-ling and her sister Ai-ling to escape on one of the last planes out of the British colony. Not long after, the Japanese army captured him. The Japanese sent him to Stanley prison camp. Guards beat him for his rebellious behavior. He was traded back to the Allies in a rare prisoner exchange in late 1943. He returned to Canada and settled in Montreal and married a woman named Judith Clark — though his continuing travels frayed and ultimately doomed the short-lived marriage. In 1945, he traveled to San Francisco where the victorious Allies were forming the United Nations. The fledgling world body was entertaining a resolution to partition the British held territory of Palestine into two states, one Jewish and the other Arab. Two Gun met with Chinese officials and played a role in convincing the head of the Chinese delegation to abstain from voting when he learned they planned to oppose partition. Cohen regularly returned to China. He was able to travel with relative ease between both Communist and Nationalist territory due to his close relationship with Soong. He told newspapers he was hoping to help negotiate a peace agreement between the warring parties, but Kuomintang and Western officials alike openly scoffed at the prospect that Cohen played any important role in the raging Civil War. When she finally returned, she took him to meet Zhou Enlai. Though he still considered himself a member of the Kuomintang, Cohen increasingly sympathized with Communist government in Beijing — perhaps due to the regime’s flattery of him. During the 1960 appearance on Front Page Challenge, a panelist asked Cohen if China was better off under Chiang or Mao Zedong. “No question. There is more happiness, more contentedness in China today than there ever has been in the whole of my experience,” he replied. He went on to point out that the Communists had effectively put an end to the opium use, something many Westerners believed impossible. Cohen continued traveling to China. Much of the time he sat in hotels talking to whoever would listen. Sidney Rittenberg, then an American member of the Chinese Communist Party and a fellow Jew, told War Is Boring about running into Cohen in a hotel lobby chatting with visiting Arab diplomats. Rittenberg greeted Cohen in Yiddish. Cohen angrily asked Rittenberg if he was trying to get him killed. Later, Rittenberg recalled Zhou toasting Cohen at a state dinner, saying in English, “Morris, old friend.” The next morning, Rittenberg found Cohen in an emotional state. He told Rittenberg that he’d overseen the death of countless Communists in Canton and Shanghai and could have easily been treated as an enemy. “They ought to kick me out and banish me forever, yet here they are toasting me,” he told Rittenberg with tears in his eyes. “Now that’s the real ‘Two Gun,’” Rittenberg recalled with a chuckle. There was of course great deal of irony to these visits. “His appearance seemed to denote a touch of sentimentality on the part of Beijing rulers, who are striving to eliminate the Chinese equivalent of people like Cohen,” TheWashington Post reporter Stanley Karnow wrote. As the Chinese wined and dined Cohen, the Red Guard were brutalizing anyone they deemed counter to the ideals of their revolution. It wasn’t long before the Red Guard arrested Rittenberg, forcing him into years of solitary confinement. Cohen would spend his last years in England. He died peacefully in his sleep in 1970. His funeral would be one of the few occasions in which both Chinese and Taiwanese officials appeared together in the same place publicly. His family buried him in Blackley Jewish Cemetery in Manchester. His grave is unique. It has inscriptions in Hebrew, English and Chinese.